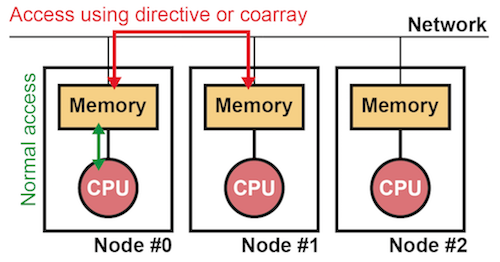 Distributed-memory systems are generally used for large-scale simulations. To program such systems, Message Passing Interface (MPI) is widely adopted. However, the programming with MPI is difficult because programmers must describe inter-process communications with consideration of the execution flow of the programs, which might cause deadlocks or wrong results. For more detail, please refer: Ken Kennedy, Charles Koelbel and Hans Zima: The Rise and Fall of High Performance Fortran: An Historical Object Lesson, Proc. 3rd ACM SIGPLAN History of Programming Languages Conf. (HOPL-III), pp. 7-1-7-22 (2007). In such circumstance, to develop a new parallel programming model that enables easy parallelization of existing serial programs and design a new language based on it, “the XMP Specification Working Group” was established in 2008. This group utilized the lessons from the experience of HPF to define a parallel language XcalableMP (XMP). The group was reorganized to one of the working groups of PC Cluster Consortium in 2011. It is learned from the lessons of HPF that more automatic processing of compilers increases the gap between a program and its execution, and, as a result, decreases the usability of the language. In XMP, users specify the details of parallel programs to make their execution easy-to-understand. In particular, users can specify explicitly communication, synchronization, data distribution, and work distribution to facilitate performance tuning. In addition, XMP supports features for one-sided communication on each process, which was not available in HPF. This feature might enable users to implement parallel algorithms easily. XMP supports both C and Fortran as base languages while HPF is an extension of only Fortran. It is advantages of XMP that it is easy to migrate with low cost of learning because it is based on existing languages. In this site, XMP for C and XMP for Fortran are called as XMP/C and XMP/Fortran, respectively. XMP for C++ is also under development. XMP is a parallel programming language for distributed-memory systems. 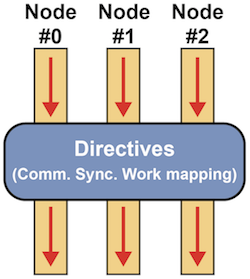 A distributed-memory system is a system where distributed memory and CPUs are connected with each other via a network, as shown in the figure below. However, actual hardware can be equipped with shared memory. In such a case, each core on a chip can be regarded as a CPU in the figure. In XMP, a combination of memory and a single CPU is referred as a node, which is an execution unit of XMP programs. Accesses to remote data residing on another node is specified with special constructs such as dedicated directives and coarrays while accesses to local data residing within the node is specified in the same way as in normal languages. The execution model of XMP follows the Single Program Multiple Data (SPMD) model, like MPI. According to this model, each node executes the same code independently. When a node encounters a XMP construct, it cooperate with each other to execute the construct. XMP supports the following two programming models. In the global-view model, users specify the collective behavior of nodes in the target program to parallelize it. As users specify with the directives how data and computation are distributed on nodes, compilers are responsible for doing it. This model is suitable for regular applications, such as domain-decomposition problems, where every node works in a similar way. In the local-view modes, users specify the behavior of each node, just like MPI. Therefore, users are responsible for distributing data and computation onto nodes. Communications in this model can be specified in a one-sided manner based on coarrays. This model is suitable for applications where each node performs a different task. Users can use both of the two models in an XMP application. Most of existing parallel applications are written with MPI. It is not realistic to port them over to XMP because each of them consists of millions of lines. Because XMP is interoperable with MPI, users can develop an XMP application by modifying a part of an existing one instead of rewriting it totally. Besides, when developing a parallel application from scratch, it is possible to use XMP to write a complicated part of, for example, domain decomposition while they use MPI, which could be faster than XMP, to write a hot-spot part that need to be tuned carefully. In addition, XMP is interoperable with OpenMP and Python. It might be difficult to develop an application with just one programming language or framework since it generally has its own strong and weak points. Thus, an XMP program is interoperable with those in other languages to provide both high productivity and performance.